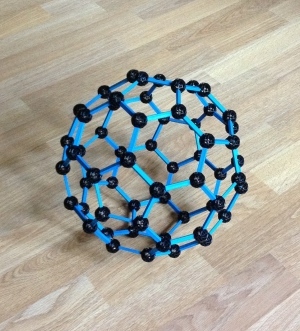 This weekend a couple of my daughters and I put together a buckyball from a Zometool kit. The shape is named for Buckminster Fuller of geodesic dome fame. Two years after Fuller’s death, scientists discovered that the shape appears naturally in the form of a C60 molecule, named Buckminsterfullerene in his honor. In geometric lingo, the shape is a truncated icosahedron. It’s also the shape of many soccer balls. I used the buckyball to introduce the Euler’s formula: V – E + F = 2. (The number of vertices (black balls) minus the number of edges (blue sticks) plus the number of faces (in this case, pentagons and hexagons) always equals 2 for a shape that can be deformed into a sphere.) Being able to physically add and remove vertices or nodes makes the induction proof of Euler’s formula really tangible. Then we looked at 6- and 12-sided dice to show that V – E + F = 2 for these shapes as well. Thanks to Zometool for sending me the kit. 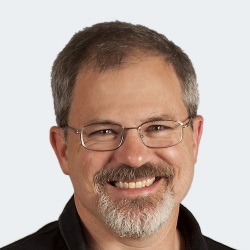 Hey John, check out vzome.com sometime. It’s free software written by my friend Scott Vorthmann that allows you to play with virtual zome models. You never run out of pieces :) Scott also runs a ‘zomegurus’ mailing list, with entertaining discussion of zome related topics. I’ve never made a bucky ball, but I have isolated C60 from fullerene enriched soot before. Then I have it to someone as a gift; they’ve probably lost it, sadly. Should have kept it. They don’t look that impressive though; just like a very, very fine black powder. Looks like fun, but I’m not sure I’d have the patience. It’s also a truncated dodecahedron, depending on which surfaces you decide to extend. I love Zomes–I just wish they weren’t quite so expensive. Quality manufacturing, I guess. Nice idea for demonstrating that Euler identity, John. BTW, I recommend Hugh Aldersey-Williams’s book The Most Beautiful Molecule for an illuminating account of the history of the discovery of the fullerenes. It gives an unvarnished account of how science actually works — warts and all.